Next 'X-Men' Sequel Set In Outer Space? As I'm literally sitting here watching all of the X-Men movies in a row, preparing to trudge my way through X-Men: The Last Stand, it dawned on me that the idea of the mutants heading into space was never approached. It doesn't happen in the films that follow, either, which is odd considering how often they leave the comfort of Earth in the comics, and because of the irritatingly constant presence of the Phoenix Force. While Bryan Singer has teased sending the X-Men into space before, he's now suggested to Fandango it could happen in the next movie. This sounds like an obvious set up to do the "The Dark Phoenix Saga" proper justice. 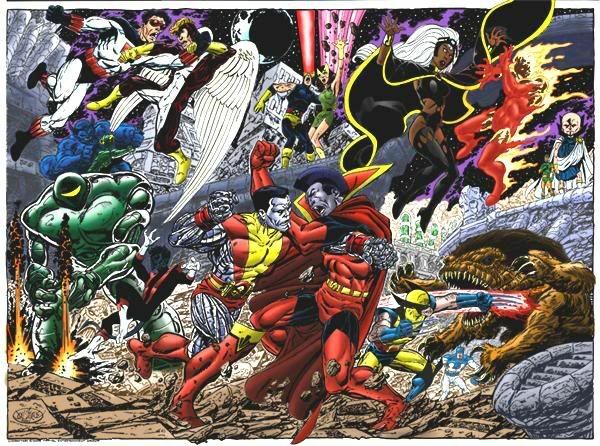 And if that's the case, then it would likely mean introducing other intergalactic elements into the mix, such as the Starjammers (which includes Cyclops' space pirate father, Corsair), the race of beings known as the Shiar, and hopefully the Imperial Guard with one of my favorite characters, Gladiator. Singer also confirmed the next film will be set in the '90s just as recent rumors claimed. All I'll say is that hints to where the franchise is going are all over X-Men: Apocalypse, so be sure to check it out on May 27th. And when you're done come back and check out my review.